Loire Valley Muscadet Wine Region. 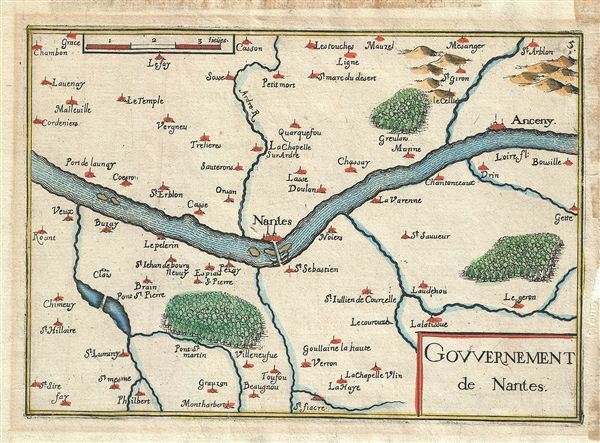 This is a rare 1634 Melchior Tavernier map of Nantes, France. Centered on the Loire River, it covers part of the French department of Loire Inferieure, France (currently known as Loire-Atlantique) from Chambon to Bousille and from Casson to Montharbert. This area of France is part of the Loire Valley wine region, and is especially known for its production of Muscadet, a white wine produced from the Melon de Bourgogne grape variety. This area is also famous for a variety of cow's milk cheese known as Fromage du Curé Nantais. Shows the region in wonderful detail with attention to cities, rivers, villages and other topographical features. This map was published in Paris in 1634 by Melchior Tavernier as part of his Plans Et Profils De Toutes Les Principales Villes Et Lieux Considerables de France. Tavernier, M. Plans Et Profils De Toutes Les Principales Villes Et Lieux Considerables de France, (1634). Good. Original platemark visible. Minor overall toning. Some older tape damage to outer margins.